This lovely engraved sterling silver bracelet will bring a smile to anyone embarking on a voyage of bravery. Maybe they received a life-changing medical diagnosis, they’re starting a new job, or they’re headed off to school. Each link in this special bracelet represents a step of courage. Taken together, the steps create a beautiful circle that signifies how they are embracing life despite their circumstances. 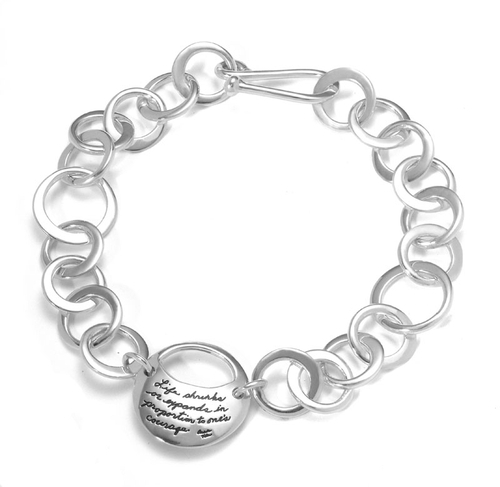 We use a specially-developed proprietary process to engrave this hand-polished bracelet with encouraging words from French writer Anaïs Nin. She believed life is a process of becoming and wrote that getting comfortable in one state was “a kind of death.” She encouraged readers to push through their fears to enjoy life to the fullest. Whenever the gift recipient looks at the bracelet, they will remember that you are behind them sharing a spirit of courage that will allow them to view a world full of opportunity and hope. The elegant oval cutout in the sterling silver token adds a special touch. Ovals are considered complete shapes that allow the wearer to embrace power and energy. It’s also a nod to the “third eye” which often symbolizes a state of enlightenment and wisdom.